This is the first fall in a long time where we’ve experienced an actual “changing of the leaves”. So often in Texas the temps shoot from blazing hot to freezing cold, without so much as a blink of the eye. We typically don’t get to enjoy the four seasons like other states further north, which is unfortunate. But this year… COLOR! It’s so refreshing. I love turning the corner only to see red, orange and yellow leaves gleaming in the golden light. It’s kinda the perfect backdrop for photos, don’t you think? Remember this post? How pretty is that tree?! Let’s just say I’m sad to see them go. Many of you already know about the Parisian brand IRO, mostly known for their amazing shoes and jackets. This season, however, a new piece has come to the forefront for the brand and is constantly in high demand: the distressed tee. Everywhere you look, this style is sold out. That is until I went into SCOOP NYC at Highland Park Village one morning only to discover this long sleeved version. Obsessed! After spending weeks not finding it online, I looked again yesterday and found that this shirt is now available on Singer22! I love the relaxed look and fit of this tee – it offers a little more depth and edge to the classic t-shirt. A great style for weekends and nights out! Click here to shop more chic styles by IRO. I really love this top…and you wore it so well. What I like about your blog is the ease and elegance with which you wear clothes. Have a great weekend! These leather pants are so good and love that bag. Love this edgier look. Beautiful bag! The knee detailing on those jeans is cool. You look beautiful in your all black look. Love the bit of edge your ripped tee adds to your outfit! This outfit is so luxurious yet casual! I love it! It’s a hard combination to pull off but you’ve done it seamlessly! I mean as great as this outfit is, I think it’s safe to say we are all waiting for more pics of that dress you put on Instagram last night. It’s SO PRETTY. Ha I thought those “holes” were embellishments at first :) Wishful thinking? Hahahaha! Well it looks awesome! 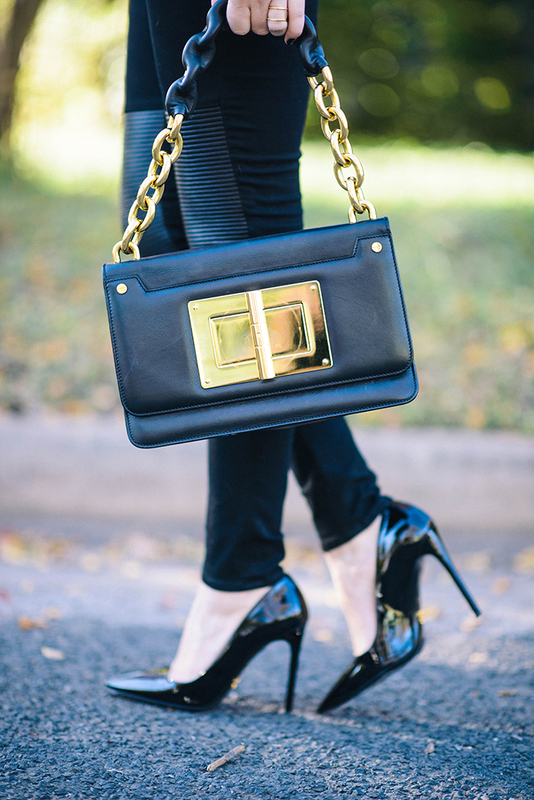 Okay, seriously coveting that exquisite Tom Ford bag and those timeless patent heels! I love an all black ensemble. It’s perpetually chic and flattering! 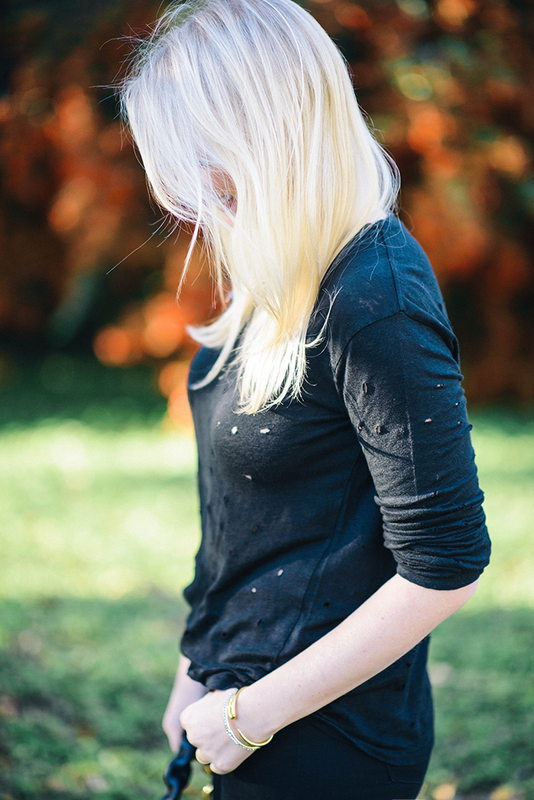 Love the distressed tee from Free People. You look great by the way. Nice heels too. 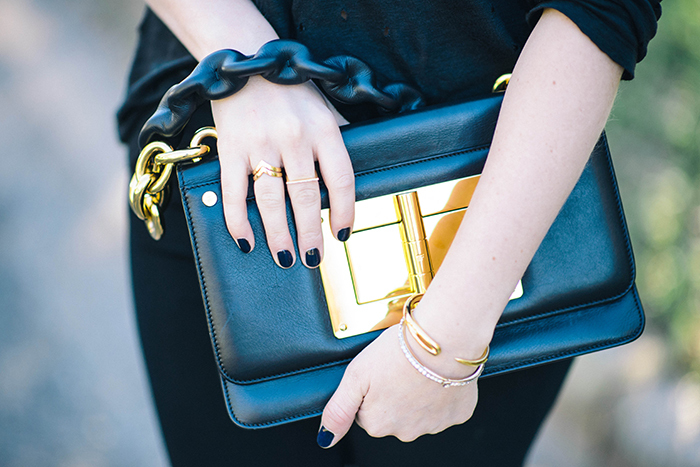 Love this black ensemble! You look so comfy and chic! LOVE the pants and that bag is just too good!